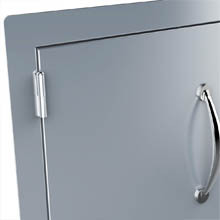 The Doors are made with all 16 Gauge 304 Stainless Steel, with a Solid Internal Framed Construction. The Door Frame is 16 Gauge – this thicker material means the door frame and panels hold stronger against the weather and usage over time, while the Door Panel is 18 Gauge, and is Framed Inward to insure the doors Hold Strong over many years of regular usage. 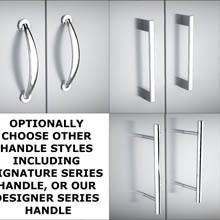 The Classic Series Doors are the Most Sleek and Stylish of all our many series of components with its even #4 Light Brushed Finishes, it shines and glimmers in the sun light complementing your Outdoor Kitchen and all the effort you are putting in, you will cherish the complimenting durability and good looks that our Doors provide, more than just functional access doors but a true example of your Outdoor Living Lifestyle. 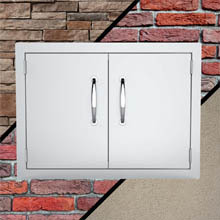 The Classic Series Doors are designed for Stone Veneer, Brick and Stucco or Concrete Finishes. 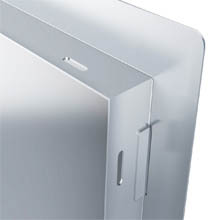 They have a 1-5/8” deep install flange – enough to secure against the internal framing of most outdoor kitchen islands, and it has a 1-1/2” Outer Flange which rest against the finished wall covering the Rough Cut-Out Edge Line. All Classic Series Doors & Drawer Components blend perfectly with all other Sunstone Doors and Drawers, unlike many other competing doors who have limited selection, this is just one of a many options in all similar matching Doors and Drawers for your Outdoor kitchen. Ways Doors can be used: Under Grill Utility Access, Under Sink Plumbing Access, Build Internal Shelving, Install own Key-Lock Entry, Access interior of Island, Place Trash Bins inside, Place Propane Tank inside.